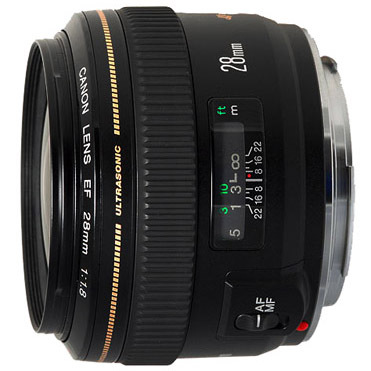 The Canon EF 28mm f/1.8 USM is a fast, sharp, compact wide angle lens that employs a Ring Type Ultrasonic Motor for silent, quick autofocus. With its large f/1.8 maximum aperture, excellent background blur is possible while shooting, which is great for portraits and fine art. Being that it is a wider angle-of-view, the edges are a bit softer when shot wide open, however when stopped down to f/2.8 any spherical aberration is cleared up and great for shooting the night sky with distinct clarity. This lens is ideal for landscape photography, street photography, and portraits for larger groups or small spaces. Compatible with both full frame and crop frame sensor Canon DSLR cameras.